Bad Dad now offers a perfectly matching rear floorboard for the its classic looking 905 Front Floorboard. 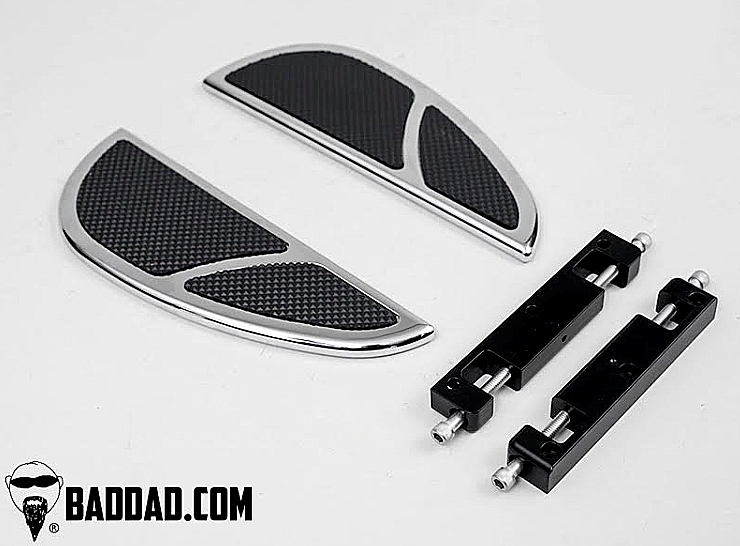 Bad Dad's 905 Rear Boards are CNC machined from 6061 aircraft grade billet aluminum and are available in gloss black powdercoat & chrome. Bad Dad's floorboards are finished with a high-quality custom cut rubber insert for a great look and comfortable ride. Fits: 1997-current Touring models & 2000-current Softail models. Note: These passenger floorboards are a direct bolt-on fit for all Touring models with existing passenger floorboards. Touring models with passenger pegs will also need to use Harley-Davidson part number 50500042. Softail models with passenger pegs should use Harley-Davidson part number 50399-05 for 2000-2006 models and 50399-07A for 2007-current models. All of Bad Dad's custom billet bagger parts are proudly machined in the USA.